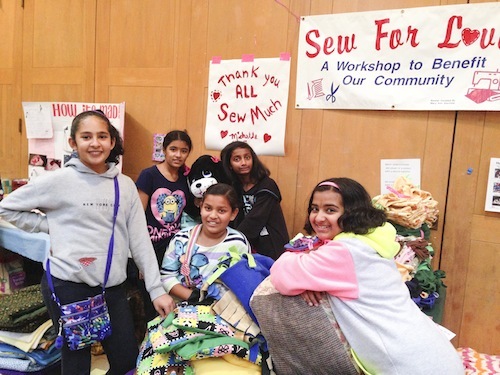 Five fifth grade girls shared the joy of volunteering during a fun community service project called Sew For Love, in which they sewed needed items for local charities. Nilisha Baid had heard about the opportunity through her Girl Scouts troop. She had met the Sew For Love organizer at Girl Scouts events and had been wanting to volunteer. So she decided to ask some of her classmates to join her at this year’s 12th annual Sew For Love, which was held on a weekend during the Presidents’ Week break. She and classmates Ankita Kundu, Advika Phadnis, Pramiti Sankar and Arushi Saxena joined other volunteers who were working in teams on various projects. More details about the Sew For Love project can be found here.